After reading Neil Spring’s The Ghost Hunters, time to watch the ITV adaptation, Harry Price Ghost Hunter. But back to Harry Price Ghost Hunter, the new ‘one-off’ drama with ‘pilot’ written all over it. Actually, it really wasn’t bad. I could probably watch a whole series if it maintained the standard of last night’s episode. It was very spooky and atmospheric while all the time playing with ideas of how we maintain rationality, accept fraud and deception, and a slew of other things, and did all of them well enough to be interesting. Like his historical counterpart, this Harry Price is a ghost-hunter, determined to find a rational explanation for everything if at all possible. Like his historical counterpart, he is interested in using scientific apparatus to record temperature and movement, to take photographs, and so on. He does the research too. Unlike the real Harry Price, at least so far as we know, the fictional Price comes with a lot of emotional baggage. In the novel Spring tried to give his Harry emotional baggage by having him conceal the fact that he was a) married, and b) running a paper-bag supply business. In reality, Price apparently made no big secret of either, though he did allegedly fudge details of his birth and upbringing to make himself seem a bit grander than he actually was. Fictional Harry Price, however, has a wife who was incarcerated in a mental asylum by her family, and also started out life as a medium himself, deceiving people himself before moving on to debunking paranormal phenomena. The story opens with a young man accosting him on his own doorstep, thanking him for making clear the meaning of being at peace and then shooting himself tidily in the head, to join his dead brother. Unsurprisingly, this puts a bit of a crimp in Harry’s work but then he is asked to investigate an alleged haunting at a large house, formerly a work house but now the private home of a prospective parliamentary candidate and his wife. The wife has been troubled by strange dreams and occurrences; most recently, she found herself naked in a street with no recollection as to how she came to be there. Her husband and his political mentor are very anxious to have the problem solved so as not to cause problems for the PPC’s burgeoning career. And so we see Price go to work, eliminating the impossible to see what’s left. So far, so Sherlock Holmes. On Price’s first visit to the house, to meet the PPC and his wife, strange things happen. The servants bells ring although the wires have been cut (a detail lifted straight from the investigation of the Borley Rectory haunting) and a canary sings in an empty room even though it apparently should only sing when there is someone there. According to the PPC’s wife, she often has a feeling there are people around her when she is on her own, and she finds herself in places with no clear idea how she got there. Subsequently, when Price wanders through the cellars of the house, he discovers a mysterious chemical spilling from a bottle, and a pile of rotting apples (the presence of the chemical again echoes the investigation of Borley Rectory, when Rev. Smith describes finding a bottle of sugar of lead in the cellar when he arrived – lead acetate, a poison, but a sweet-tasting one). There is also a photograph of the children from the workhouse. So, at this stage, the story could go one of several ways – a genuine haunting, or attempted murder (perhaps by the husband, eager to get rid of a wife who might be getting in the way of his political prospects, either by his own design or at the insistence of his repellent political advisor). Or the wife could be faking it because she hates living in the house, hates politics, or she is genuinely ill. Given the way that children seem to feature in the haunting, there is also the possibility that she has lost a child, or wants a child. Interestingly, her husband refuses to get medical treatment for her, because he is concerned that she will be locked away, something he feels would be wrong. Price begins to pursue these different lines of enquiry, with the help of Sarah Grey, the house maid, who is initially assigned to act as his driver (she drove ambulances during the war) but quickly reveals herself to be sharp-witted, observant, a good researcher. It is she who ferrets out the story of the child murdered at the workhouse, drowned by another inmate. Price, meanwhile, has his associate , Albert Ogoro, ‘practitioner’ of some kind of African magic by night, fully-trained chemist by day, analyse the chemicals. Ogoro also assists in the first night of investigation, helpfully planting a device in the piano to make it play on its own. He is entirely pragmatic about his dual life as fake magician and chemist. As he explains to Sarah Grey, the hen he apparently sacrifices remains alive, but the people who attend his ceremonies are anyway so desperate that if what he does offers them comfort of some sort, is it so very wrong? His approach is in stark contrast to Price’s mission to denounce and debunk the fakery: we see him break up a medium’s performance on stage, trying to explain to people what is really going on, showing them how it is faked, but to no avail. As the master of ceremonies suggests later, is it because Price himself has lost someone (the audience of course knows that it probably is – we might recall Harry Houdini at this point, who spent much of his life debunking mediums after he realised that they could not put him in contact with his dead mother). All this is significant in turn because Sarah Grey’s mother is a regular attendee at séances and public displays, spending money she does not have on tickets, seeking some sort of closure after her husband’s death. Whether Sarah Grey herself believes is less clear – her anxieties remain financial. The point, though, is that what the novel tried so very hard to convey is here placed firmly in context with a few well-chosen scenes, and done with considerably greater sympathy for those who are being deceived, and indeed those deceiving them. But back to the case in hand. The chemist Ogoro has identified the chemicals that Price found (not arsenic, as I’d thought, and they go to great pains to say that it is not arsenic that lies at the heart of this) and something is clearly amiss. By this time, the young reporter Vernon Wall, the man who in real life broke the story of Borley Rectory, has turned up; he and Price seem to have some sort of history anyway, and Price persuades him to look into the background of Goodwin, the candidate, and in particular why he left his previous constituency. Which eventually leads them to the River Thames, a narrow boat, and a meeting with a young man who turns out to have been Grace Goodwin’s lover. And there was a pregnancy; the baby should be three months old. Needless to say, there is no sign of a baby. By this time, it would be fair to say that the plot is not so much convoluted as a tiny bit over-extended and starting to flag, but we are fast heading towards a denouement. As has been clear all along, it was the husband, but the question is, what was he doing. Early in the story, it’s mentioned that his father was a chemist, and that he in turn studied chemistry for a while. It turns out he was making a crude form of barbiturate, with which to dose his wife, having discovered her infidelity. This caused her hallucinations, and meant that she miscarried the child, and afterwards, she suffered from terrifying withdrawal symptoms. Price, Ogoro and Sarah Grey intervene as Goodwin is in the throes of attempting to drown his wife. But this is where the drama introduces an odd little twist. Goodwin had previously attacked Sarah Grey and left her unconscious on the floor. When she wakes, she can see the figure of a child pointing up the stairs; it’s a figure that has appeared a number of times, and that we’re led to suppose is exclusively Mrs Goodwin’s hallucination. Indeed, as Goodwin drowns his wife, she sees the figure of a child below her in the bath tub, reaching up. And yes, of course it’s a piece of sensationalism, but rather nicely done (certainly in comparison to some things, like the soundtrack, which was extremely noisy). Price’s whole schtick in real life was to attempt to eliminate the impossible, but he claimed to be open to the fact that possibly, just possibly, some people were psychic, and maybe some ghosts were real. Here, the audience is invited to wonder. The whole thing is tidily closed down with Price doing a private sitting for Sarah Grey’s mother, to reassure her. Things are looking up for Price, and he might need an assistant. The resourceful Sarah Grey is clearly the person for the job. And yes, I would actually like this series to happen, at least if it keeps to this sort of standard of storytelling. It’s not surprising, particularly, but it was effective. I’m writing this, of course, primarily because I’m interested in how the book became a tv drama, what was saved, what was discarded. As I predicted, practically everything except the names went. A little of the story of Grey’s parents was retained; watered down, one might argue, rendered simplistic and perhaps a little sentimental, but at the same time, I liked the fact that it engaged sympathetically with the fact that people wanted comfort after the War, wanted to know what had happened to their lost relations and so on. The drama catches the dilemma rather better, I think, than the novel, perhaps because the novel was unwilling to address the broader implications of what the mediums were doing. There is a point in the drama when Price mentions a doctor in Vienna; it’s an oblique hint that for many people mediums were the therapists they needed but which were not yet available to them. Which is not to say that we should regard mediums as a necessary part of the grieving or healing process – some were downright sharks, feeding on misery, but removing them would not eliminate the need. The real point being made, perhaps, is how much deception is good, and how much bad. The tv Sarah Grey is a more sympathetic character than her novel counterpart; more likeable though sharp-tongued and not necessarily impressed with Price. She’s willing to spar with him and certainly doesn’t worship him. There is a certain amount of needling him about his perceptions of a woman’s capabilities. She takes the initiative on a number of occasions; the camera doesn’t always follow her but we see the end results and they are acknowledged as her work. This is no coup de foudre but more a meeting of two people with a formidable array of skills between them. Cara Theobald positions Grey as Price’s equal throughout, in a very crisp piece of acting. But hey, it was fun, which is more than can be said for the novel. The 2015 Fund Drive ends in 5 days, 14 hours, 58 minutes, and 47 seconds. I should declare an interest in this. I work for Strange Horizons as Senior Reviews Editor. I’m very proud to be part of a great team of editors, copy editors, proofreaders and web people, putting this magazine together and sending it into the world every week. None of us gets paid for this. We are volunteers, working in our free time to bring you stories, poems, articles and reviews. The 2015 Fund Drive ends in 5 days, 14 hours, 56 minutes, and 12 seconds. So where does the money raised by this fund drive actually go? Some of it goes towards keeping a website online, and the other attendant expenses of running a magazine. Most of it goes towards paying our contributors – our authors, poets and artists. Let me say that again. We pay our contributors. The 2015 Fund Drive ends in 5 days, 14 hours, 52 minutes, and 56 seconds. We pay for great articles, artwork and stories, poems and reviews. And unsurprisingly we get great articles, artwork and stories, poems and reviews. I may be biased about the reviews (we have fabulous, insightful reviewers) but I’m a little less subjective about the articles and stories and poems. They’re wonderful. Trust me. The 2015 Fund Drive ends in 5 days, 14 hours, 49 minutes, and 59 seconds. More seriously, ever since I first discovered it online, Strange Horizons has been the place I turned for something new, different, original. Some of my favourite stories have been published by Strange Horizons, and some of my favourite articles and reviews, too. And thanks to Strange Horizons, I’m starting to develop a better appreciation of science-fictional poetry. A lot of people I respect and admire are associated with the magazine. It still gives me a buzz to realise I’m now actually part of this amazing thing as well. The 2015 Fund Drive ends in 5 days, 14 hours, 46 minutes, and 45 seconds. But we can’t do it without your help. Strange Horizons is reliant on your donations, which is why we have an annual fund drive. It’s your money that keeps us going. It doesn’t have to be much – every dollar helps ensure that we keep going for another year. You can make a one-off donation for the year or, new this time, you can spread your contribution over the year by signing up for the Strange Horizons Patreon (which is what I’ve done) and get regular Strange Horizons ebooks, and also admire Niall Harrison’s fund-raising graphs. All those donating are entered into our prize draw – there are some great prizes, and I’m really envious of those of you who are eligible. The 2015 Fund Drive ends in 5 days, 14 hours, 42 minutes, and 40 seconds. To donate, go to the Strange Horizons fund-raising page which explains all the options for giving. The 2015 Fund Drive ends in 5 days, 14 hours, 37 minutes, and 30 seconds. Reaching the next fund-drive target will unlock a brand new Kelly Link story. Help us get there. Be part of the wonderful thing that is Strange Horizons. The 2015 Fund Drive ends in 5 days, 14 hours, 36 minutes, and 9 seconds. This entry was posted in Uncategorized on October 14, 2015 by maureenkspeller. 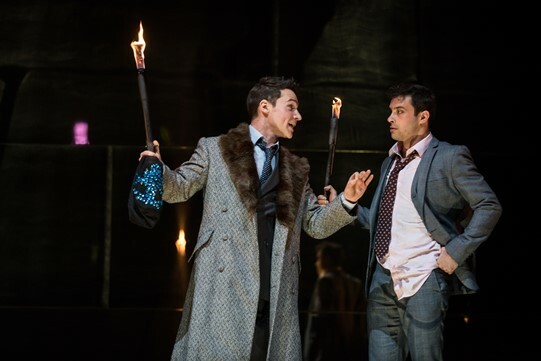 Back in 2015,and the Royal Shakespeare Company presents a new Merchant of Venice for our delight. My first thought was that this was possibly going to be another crowd-pleaser. 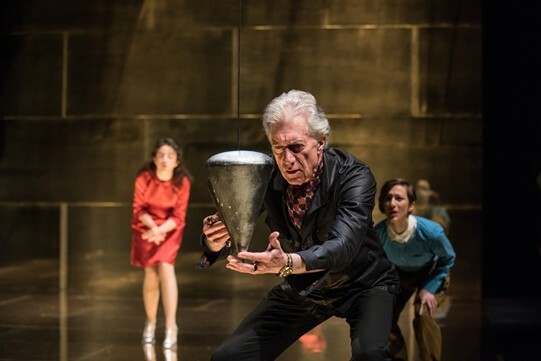 Since Gregory Doran took over as Artistic Director of the RSC, I’ve felt that the company was taking the easy option in its choice of plays – Richard II, Henry IV Pts 1 and 2, and the Love’s Labour’s Lost/Found pairing. The last two, in particular, were rather disappointing. Conservatively directed and designed, and with a strong sense of their being jemmied into a WW1 framework to bring in a bit more money at the box office, what with anniversaries and all that. However, while the productions were a little bit too stiff upper lip and patriotic for my taste, they were distinguished by excellent acting and some good bits of business. The end result, though, was tepid. The Merchant of Venice turns out to be rather different. It opens with a tearful Antonio on stage. Indeed, he’s on stage for some time before the play officially opens, standing awkwardly, pensive, and as it turns out, tears streaming down his cheeks. He is, it is noted, of a melancholic turn of mind, but at this stage, while his ships are late, they are not yet lost, so something else is clearly amiss. The clue is perhaps contained in the passionate kiss exchanged with his friend Bassanio, when he appears. Antonio has previously bailed out his friend, young, impetuous, extravagant, when he got himself into financial trouble. Now Bassanio is searching for money to finance an expedition to woo Portia, a wealthy heiress, and he has come to his friend – his lover? – for help. Which Antonio will of course give, because he loves Bassanio, but to do so means that if Bassanio wins Portia’s hand, Antonio will lose his lover. We might pause here and wonder whether Polly Findlay is over-interpreting the love between Antonio and Bassanio, but Findlay seems very determined to make this a contemporary play in every way. The characters are in modern clothes, carefully dressed to establish their social positions straight away. 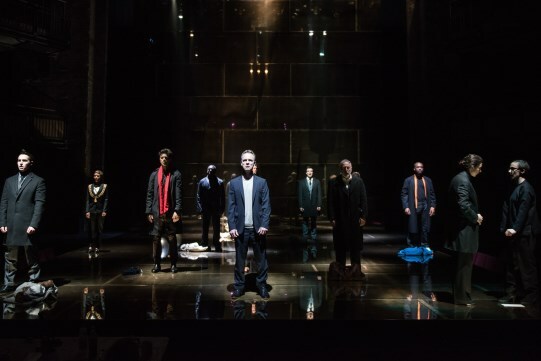 Antonio’s and Bassanio’s fellow merchants look more like city wide-boys while Shylock, stripped of his Jewish gabardine, is dressed instead in a suit that has seen long use, plus a pullover under his jacket, for all the world like a small-town solicitor or faintly seedy academic. The women are all band-box smart, with the exception of Portia’s maid, Nerissa, who wears a more casual shirt-trousers ensemble. It comes as no surprise, either, that the emphasis is always on money, rather than looking for love to trump cash. Everything has a price, and that price is made quite clear. Money constantly changes hands, or else flutters around the stage. It may be that Bassanio and Portia genuinely feel affection for one another, but we can never forget that Bassanio needs to make a good marriage because he is broke, and that, if we read this production as I suggest, he will doubly sacrifice Antonio in order to do so. We are left in no doubt that Lorenzo and Jessica’s match is one fuelled on the one hand by a desire for money, on the other by a desire for freedom, rather than anything romantic. We cannot be sure that they will live happily ever after, any more than we can be sure that Portia and Bassanio and Antonio will come to any sort of accommodation. And then there is Shylock, played sympathetically here by the mesmerising Makram J Khoury. While Hall’s production hinted vaguely at the idea that Shylock might not necessarily be the villain of the piece, Findlay’s production addresses this directly. 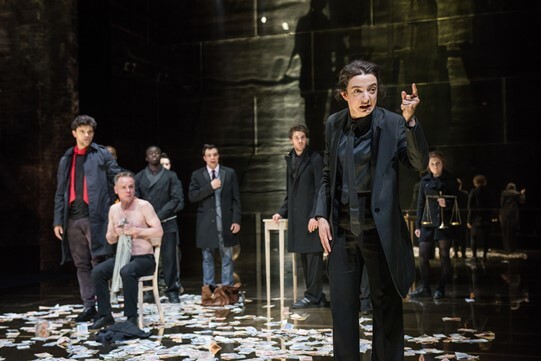 Twenty-six years changes many things, not least me as a member of the audience, sitting there, watching young men spit in Shylock’s face and growing more and more angry with what the play is saying. No, Shylock is not a good man, but neither is Bassanio or Antonio, or any one of the others. Antonio may be gladly presenting himself as the necessary sacrifice for Bassanio’s happiness, though there is nothing remotely stoical about the way in which he prepares himself for the surrender of his flesh, but I found myself thinking more of Shylock’s stubborn refusal to relinquish his bond even when offered thousands of ducats. It is, of course, the only shred of power or authority he can claim in all this. He has lost his daughter, been robbed by her, even to her taking a keepsake of his dead wife. Despite his best efforts, you might say, she has been ‘contaminated’ by Venetian society. And his best efforts have been directed towards preserving that which is familiar to him, a society which no longer exists. Thus, Antonio the merchant who rejects usury, who helps people in debt to Shylock, becomes the focus of everything that is bad about the world for Shylock. 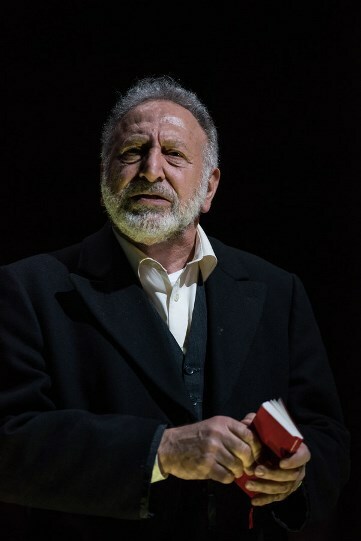 Khoury’s Shylock is screaming with existential pain as he gasps out his years of bitter treatment at the hands of a society that needs him but cannot bring itself to admit that he is a necessary part of that society. Khoury’s performance is intensely powerful, shaped, as he said in interview, by his own experience as a Palestinan Israeli. It’s impossible to watch it without flinching in distress. And what of Portia? The heiress obliged by her father to go through an irksome guessing game with suitors in order to find a husband. Wise father, we might think, looking at some of the suitors who rock up at her door, including the antiquated Aragon (beautifully played by Bryan Protheroe, wittily employing a series of 1960s/70s comedy seducer tropes), and the young Prince of Morocco, who thinks just a little too well of himself. And yet, it’s clear that without a little help (ok, quite a lot of heavy signalling from Portia and Nerissa), Bassanio would make precisely the same mistakes as did his predecessors. He is young, enthusiastic, and bluntly as thick as two short planks, bless his little pointy head. His friends don’t help much, either. Perhaps only Antonio, older, maybe wiser, could guide him. Patsy Ferran’s performance as Portia is astonishing. She seems physically tiny, with a heart-shaped face, huge eyes, quizzical eyebrows, and gives the impression of constantly suppressed energy, physical and mental. She appears to have spent a lot of time on her own – conversation seems to fascinate her, as does the chance to actually articulate her ideas out loud. We infer her father was perhaps rather old-fashioned about women’s place in society. While Jessica’s rebellion is physical flight, Portia’s rebellion is the outpouring of words with a metacritical track as she tries to wrench herself back to a semblance of proper behaviour. I’m guessing that this is what Geraldine James’s coltish performance was supposed to achieve, though it failed horribly. Here, it works perfectly. Ferran also pulls off something that I think neither James nor Shaw achieved, in that her Portia is all of a piece. The Portia who does her best to stamp her authority on the game being played with her body as prize in the first half is also the Portia who storms into the court of Venice to save her husband’s best friend. This is a Portia who, delighting in the freedom to use words in the first half, understands the power of words in the second half. And yet, there is something horrible in the way this Portia glories in her new-found power, still too immature to understand the damage words can do. And yet, at the same time, as she watches Bassanio and Antonio, you can see her realising that other aspects of the world don’t necessarily work as she thought they would. It’s quite clear that Bassanio is happily bisexual; his partners seem less certain about sharing, and perhaps Portia is already realising that she will be supporting not one man but two. It’s undoubtedly a very dark reading of Merchant of Venice: Findlay doesn’t even allow Antonio the luxury of knowing his ships have come home safely after all. Maybe in this version they never will, and maybe Antonio will lurk in Portia’s house – and she makes it very clear that Belmont is her house – grabbing a few moments of pleasure with Bassanio as the time allows, while Bassanio rushes around, spending too much, convinced that everyone in his world is happy, and Portia comes along behind, sorting things out and making ends meet. Bassanio’s great moments of passion come in trying to save his friend. Whether he will ever feel that for Portia, we have no way of knowing. 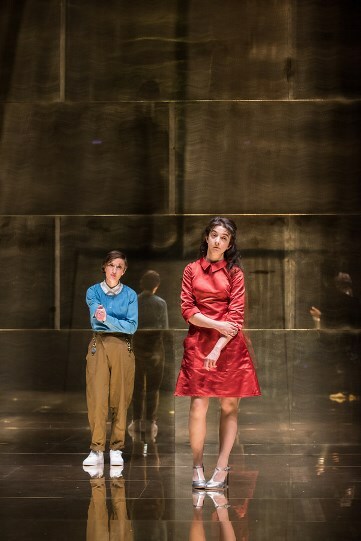 It’s probably not perfect – a little too much is assumed at times, a little too much not quite explored – but I’m glad to have an RSC production again that seems to have some teeth rather than relying on the set or comic business to get it through. The set this time was – very brassy, I think it would be fair to say. The stage was covered in highly reflective brass sheeting, giving a doubling effect I’m sure was meant to be significant but which felt a bit contrived. I’d love to see the RSC go for something more stripped down. I still have a fond memory of a very plain Hamlet done with a white stage and a few boxes as props. Or was that the ‘shirtsleeve’ Macbeth? Either way, more of that. I’ve already mentioned Patsy Ferran and Makram J Khoury, but Nadia Albina (Nerissa) and Jacob Fortune-Lloyd (Bassanio) are well worth watching. Fortune-Lloyd is playing Cassio in the forthcoming Othello, and I’m curious to see what he will do with that. Tim Samuels’ gorgeously laconic Launcelot Gobbo was a delight and Ken Nwose’s turn as an over-excited Gratiano was also very amusing. 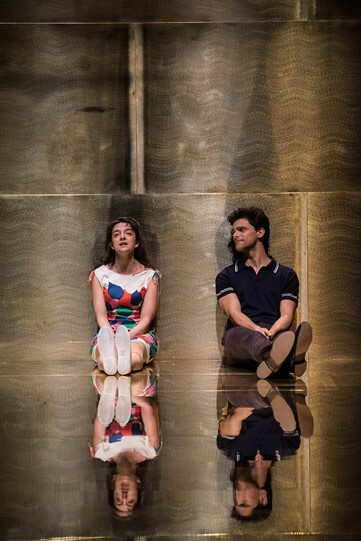 In fact, I thought the whole cast worked well – most of them are new to the RSC but they looked confident as a group. 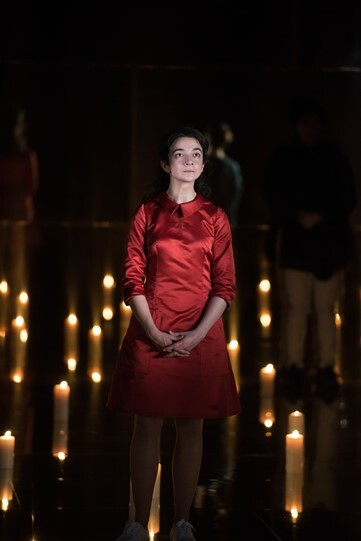 Ferran is barely out of drama school, which makes her Portia all the more remarkable a performance. Jamie Ballard’s Antonio, on the other hand, remains a mystery (though maybe another viewing will sort this out in my mind). Sadness is not the same as melancholia, though the latter might be a cover for the former. Ballard’s Antonio seemed to me to be a man at the end of his tether, rather than a merchant gravely trying to deal with his crises and help a friend, the way we’re trained to see him. 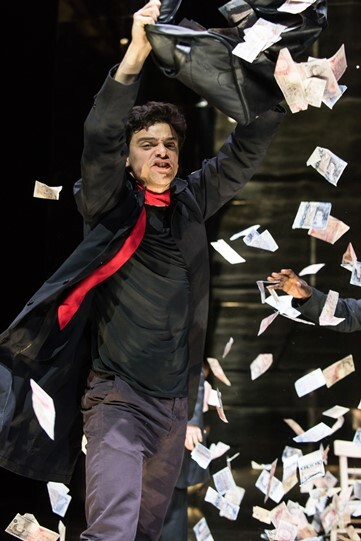 Indeed, it seems to me now that Antonio and Shylock have more in common than I realised when I started watching, in that their professional standing is under threat but they might be said, in this production at least, to both be losing something they love very much. And this, of course, is why, in this production, Antonio’s ships do not come home. So, yes, I’m satisfied with this Merchant of Venice, possibly even excited. It provides food for thought and lingers in the mind, which is pretty much what I want from a production. Having said that, it might not be as risky as it at first appears, when compared to a string of rather staid productions (I remain utterly unconvinced by Sher’s Falstaff in Henry IV part 1 though part 2 seemed to me to go a little deeper into the character – one could wish Polly Findlay had directed that), but at least Polly Findlay was willing to have a go. 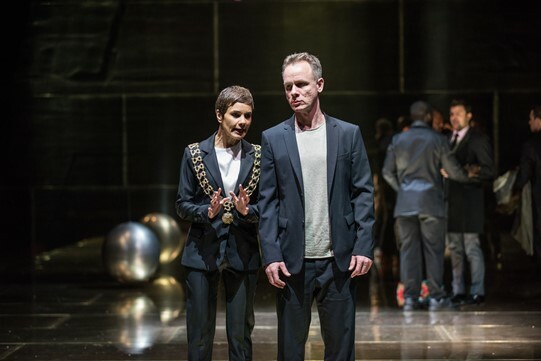 We also saw the trailer for the forthcoming production of Othello, which I am uncharacteristically excited about. I did Othello for A level, and am still scarred by the experience of being dragged off to the cinema to see the awesomely appalling Laurence Olivier version. Even then we knew in our heart of hearts that a white man blacked up was wrong, and Olivier made it super wrong with a performance that chewed every bit of scenery in sight. I’ve also not forgotten the previous RSC production I saw, with Ben Kingsley as Othello and Niamh Cusack as Desdemona. I saw a lot of Kingsley on stage at that time and while he was generally good, the Othello? Not so much. I’m hoping this Othello gets it right. This entry was posted in Uncategorized on July 23, 2015 by maureenkspeller. I’ve decided to close the comments function on Paper Knife. The only comments the blog attracts are from spammers and I’ve got better things to do than sort through the spam trap every week. You can of course email me if you want to talk about a post. This entry was posted in Uncategorized on July 17, 2015 by maureenkspeller. ‘Imagination is as close as we will ever be to godhead,’ observes a character towards the end of Poison. ‘[f]or in imagination we can create wonders.’ But if imagination is the driving force of fiction, why then does one always feel slightly uneasy when an author talks about the process of creating fiction even while creating it. Was that a knowing wink to the audience or did one just catch the author’s eye at an inopportune moment? Did the façade of fiction fall over intentionally, or was it caught a glancing blow by a clumsy protagonist? In flaying the carcass of the work as it progresses, does not the author also risk laying bare its flaws and inadequacies? In the case of Poison, it’s not always easy to tell what Chris Wooding’s intention is, and neither is it easy to tell whether or not that is Chris Wooding’s intention. Wooding’s most recent novel, The Haunting of Alaizabel Cray, a young-adult fantasy, was set in an alternative quasi-Dickensian London threatened by wyches, supernatural beings that Thaniel Fox hunted down and killed in order to make his living. The novel was striking for its distinctive, atmospheric settings, its attractive if not always likeable characters, and Wooding’s ability to fuse magic and technology in a manner that felt plausible. Admittedly, the plot was conventionally framed as a race against time to save the world from evil forces, but the story was told with verve, and it rightly garnered critical acclaim. In Poison, Wooding has set his sights on something rather more ambitious. His approach is best summed up by an incident part way through the novel, when the four main characters make their way secretly through an enemy’s castle, moving along a narrow passageway between the inner and outer skins of the building, peering into rooms as they go. Much of the second part of the novel hinges on a series of observations which they make during this clandestine progress, and their subsequent ability to understand the significance of what they have seen. Even as he tells his story, Wooding invites the reader to slip through the interstices of plot and narration in order to admire the manner of their construction. The question is, can Poison stand up to such intense scrutiny? An experienced reader will already be struck by the patness of the story, even down to Poison’s possessing violet eyes, a sure sign of literary destiny. There are hints of a deeper, wider-ranging story – Wooding institutes some playing with names (Poison’s original name is Foxglove, her birth mother was Faraway, her stepmother is Snapdragon) and offers a tantalising analysis of the female characters’ various discontents – but this is finally sacrificed to Poison’s story. Swiftly and inevitably, Poison shows herself to be a competent heroine when her sister is snatched by the Scarecrow, a sandman-like figure, and a changeling left in her place. Almost before one can blink, she is standing by the side of the road, waiting to hitch a lift with a wraith-catcher who had fortuitously been staying in the village the night before, and who will take her to the city to begin her quest to recover her sister. Yet this is not formulaic fantasy. Wooding has already expended too much energy on neat touches and on small details which, alas, he will not follow up on later. Clearly something else is happening; the question is, what is it? ‘It was just like the stories,’ begins one chapter, the chapter in which the three companions: competent girl, brainless but beautiful girl; older, reliable male, and their supernaturally bright cat, head into a glaringly perfect fantastic landscape. Indeed it was, and this is what we are supposed to notice, even without Wooding flagging up the fact quite as vigorously as he does. And were we to be left in any doubt, the group quickly encounters a figure familiar to readers of C.S. Lewis. He may be called Myrrk, but it’s very clear that his ancestry includes a large quantity of marsh-wiggle. His entire raison d’etre within the text appears to be to provide a commentary on what is and isn’t customary in a work of genre fantasy, and, more significantly, on authors who do not fully sketch out their characters. His is an unexpectedly large and unsubtle textual intrusion, compared to others in the book, but there are many. Here be not so much dragons as unadorned hints about the artificiality of text. There is a point to this, it turns out. Poison’s world is one of many that jostle alongside one another, all of them presided over by the Hierophant., whose castle is notable for having a library which is somehow present in all those different worlds. The Hierophant – a person, especially a priest, who interprets sacred or esoteric mysteries – is the creator, the author even, of these worlds, even though his job nowadays is more to give them a nudge, here and there, as they find their own ways, than to actively create new worlds. But when the Hierophant writes, his words literally are law, which means that he is still a force to be reckoned with, even if his creations, or those of his predecessors, appear to exert free will. Which is particularly problematic for Poison, once she realises what the reader must already have guessed, that the Hierophant has written her journey for her, guiding her to his castle to become his apprentice. Given that her entire life has, she believes, been driven by her own free will, how can she deal with this outbreak of determinacy? By exerting her own will, of course, by deciding to die and thus thwart the Hierophant’s plans. And yet, as Poison wills herself to death, everything around her fades, because it’s her own story she’s in control of. The moral is irritatingly clear and of course Poison lives on. The very neatness of this revelation marks what has become so evident in the story as it progresses. It’s become too tidy, anodyne even. In walking Poison through the conventions of genre, the Hierophant, preoccupied with his sacred responsibility to the text, seems to have eliminated any chance for her imagination to flourish, and the same extends to Wooding in his hierophantic relationship with the text. Plot, as I’ve previously observed, is not his forte, although he is capable of turning out some frankly barnstorming set-pieces. His evocation of Poison’s marshland home fairly reeks of the swamp, and his descriptions of Poison’s encounters with Lamprey, victim of a kelpie, and Asinatra, Lady of the Spiders are terrifying in a way that owes a good deal to M.R. James. He also has the ability to find the telling phrase. The court of Aelthar, Lord of Phaerie, is described as being ‘glutted with perfection and beauty’, a succinct and effective description, simultaneously evoking wonder and disgust. However, the novel as a whole is undoubtedly less than the sum of its parts. Humans may have the one thing the inhabitants of other worlds lack, but possessing imagination is not the same as using it. We can explain away the artificiality of the plot as an expression of the Hierophant’s need to train Poison. Indeed, at one point, another character comments on how the stories Fleet told her seem to have been ‘more like a survival manual than a story.’ That is the nub of the problem. While Wooding is, I’m sure, trying to convey to his adolescent readers the power of story, how it can bring colour to an impoverished existence and offer hope for the future, he, like his own creations, has told more than he has shown. Inspiration has been replaced by worthiness. Wooding’s aspirations for his novel have, on this occasion, stretched further than his talent to convey them. Had he been a little less ambitious, he might have been more successful in telling a story. Godhead will have to wait for a little longer. This entry was posted in Uncategorized and tagged chris wooding, foundation on April 1, 2015 by maureenkspeller. Another review from Vector, this time from last year. As I’m writing this review, the shortlists of two awards have just been announced. One, for the three David Gemmell Legend Awards, featured seventeen white men. The other, for the John W Campbell Award for Best New Writer, included women and writers of colour on its shortlist of five. Which shortlist then is the more representative of contemporary SF and fantasy publishing? The answer is, of course, the Campbell Award. Yet given the nominating process for the Gemmells is much, much broader in its intake than that of the Campbell, one has to ask just how it happens that so many readers of speculative fiction either do not seem to be aware that it is also being written by women and by writers of colour or, worse, simply don’t want to acknowledge that fact. This is 2014, for heaven’s sake. This is a question that Bill Campbell, co-editor of Mothership: Tales From Afrofuturism And Beyond, has frequently asked himself. As he puts it, ‘mainstream, American corporate culture ‘whitewashes’ all culture – past, present, and future – giving people the false impression that America has been, is, and always will be the “White Man’s Country”.’ This is reflected in much of the science fiction emerging from the USA in the last half century or so. I pause here, briefly, so that someone may observe – as someone inevitably will – that the protagonist of Robert Heinlein’s Starship Troopers is a person of colour. Or that Samuel Delany is a writer of colour. Star Trek! Octavia Butler! While not denying that all these facts are true, an argument that relies on such a small number of data points to prove that US science fiction is not a purely white male enclave is a poor one, especially when it is the same two writers of colour who are continually offered as proof of the genre’s diversity. We can surely do better than this. What is all too easy to miss is that fantasy and science fiction is being produced by writers of colour but that it remains, for whatever reason, not as immediately visible as the work produced by Anglo-American writers. In part this might be that such stories are not published in mainstream genre venues (several of the stories in Mothership are reprinted from ‘literary’ journals) or simply because these stories are scattered through a wide variety of small-press publications and anthologies, lost in the welter of fiction being published. It takes projects such as these or small press magazines such as Crossed Genres, which has a specific brief to recognise diversity in what it publishes, to draw the attention of the wider reading public to what’s actually out there. Likewise, it has not always been easy for writers of colour to publish collections of their work, though the burgeoning independent publishing scene is mercifully changing this. Mothership, edited by Campbell and Edward Austin Hall, and We See A Different Frontier, edited by Fabio Fernandes and Djibril al-Ayad, are part of an informal movement that directly opposes the idea that science fiction is, or should be, exclusively a white male Anglo-American activity. Charles Tan and Lavie Tidhar have been pushing this idea strongly for some years through the award-winning World SF blog, now alas in abeyance, and it has also been heavily promoted through social media. These two anthologies, both crowdfunded, take different but complementary approaches to demonstrating the genuine diversity of contemporary SF with Mothership offering us a dazzling variety of authors and stories, while We See Things Differently is more philosophical and structured in its approach. In Mothership, Campbell and Austin have brought together a staggering range of authors, a good half of whom are new names to me (I thought myself reasonably well-read but clearly I’m not). If a preponderance of the authors are resident in the US, this only serves to show how ridiculous is the assumption that SF must be by and about Anglo American men. And if a good percentage of the stories are reprints this serves only to remind us that the genre has been rather more diverse for rather longer than most of us realise. Campbell and Austin also work with a commendably broad definition of genre, what Austin calls an ‘open-arms, fantasticated-tales-by-and/or-for-and/or-about-people-of-color approach ‘. In practice, this means that a story such as NK Jemisin’s ‘Too Many Yesterdays, Not Enough Tomorrows’, a neat take on the effects of the tiny universes we build for ourselves online (all the while in dialogue with EM Forster’s ‘The Machine Stops’) can sit alongside Charles R Saunders’s ‘Amma’, about the fate of a woman who can transform herself into a gazelle, told by a griot in the marketplace, while Abenaki writer Joseph Bruchac’s ‘Dances With Ghosts’ is, unsurprisingly, a ghost story, one which wittily reframes themes familiar from Native American novels such as Momaday’s A House Made of Dawn. These stories challenge the reader’s expectations and assumptions in other ways. It is all too easy for ‘white people’ to look to indigenous writers and writers of colour and either expect to be educated about another culture or to assume that because you read fiction written by someone who identifies with a particular cultural group, this means you have gained knowledge of that group. Throughout Mothership there are stories that subvert such assumptions; indeed, the collection’s opening story, ‘I Left My Heart In Skaftafell’ by Victor LaValle, should stop such nonsense in its tracks. LaValle’s African-American narrator is on holiday in Iceland and notes the reactions to his skin colour from others on the trip but his story isn’t about that; it’s about the narrator’s sustained encounter with a troll. Lauren Beukes’s ‘Unathi Battles the Black Hairballs’ is rich with references to animé; it tells us about Beukes herself, not what it means to be a white South African. SP Somtow’s ‘The Pavilion Of Frozen Women’ is a story about a serial killer, with hints that the killer might have been driven to it because of the pressure of being part of an indigenous minority (and the narrator is herself Native American) but it is primarily about the events leading up to the deaths rather than the issues behind them. There are so many different kinds of story in Mothership, and stories of such high quality, it is actually very difficult to single out particular favourites. Other than the stories already mentioned, I was particularly taken with Tobias Buckell’s ’Four Eyes’. This deals mostly with a young Jamaican man, Manny, finally acknowledging that his destiny is to become a ‘four eyes’ or obeah man. What really intrigued me is the way in which his teacher, Jimiti, easily accepts that La Llorona, the Weeping Woman, is his spirit guide, although ‘she ain’t even the right mythology for me to see. And she had ask me, “what the right mythology, Jimiti? You a two hundred-year-old blend of cultural mess”’. Other outstanding stories include Rochita Loenen-Ruiz’s ‘Waking the God of the Mountain’, which deals with issues of territorial sovereignty and deep, powerful ties to the land, as well as Rabih Alameddine’s delicate, tender ‘The Half Wall’. But there are so many good things in this anthology. If you want to get some idea of just how diverse SF can really be, Mothership is a great place to start. We See A Different Frontier takes a slightly different angle, as its subtitle makes clear: A Postcolonial Speculative Fiction Anthology. Aliette de Bodard’s preface takes up this theme: ‘When we read science fiction stories where colonists leave their home and hearth, and make contact with funny-looking aliens, we are uncomfortably reminded of the days when English or French or Dutch colonists came to foreign shores … and gradually took over everything under the pretence of “civilizing” barbarians. ‘ The voices we hear in WSADF, then, are those of ‘the invaded; of the colonized; of the erased and the oppressed; of those whom others would make into aliens and blithely ignore or conquer or enlighten ‘. In other words, these are the voices which supposedly don’t exist, the voices of the Gayatri Chakravorty Spivak’s famous subalterns. Yet these subalterns are only too eager to speak. Shweta Narayan’s exquisitely allusive ‘The Arrangement Of Their Parts’ leads off the collection. The story’s setting appears to be the Mughal empire in the time of Aurangzeb, its sixth emperor, described in this story as a usurper. One of the sons of Shah Jahan, builder of the Taj Mahal, Aurangzeb engaged in a series of wars to overthrow his brothers and gain the throne. This, though, is simply background to a story in which the Englishman, Sir James, encounters what appears to be some sort of automaton. To judge from his workshop, this is not such he has encountered; the others he has dismantled. The Artificer Devi, however, has something else in mind. it is possible to read this story simply as a cyberpunk interpretation of the presence of the British in India, but it seems to me that there is also another more slippery layer of allegory in play, given the significance of the peacock in Indian culture. Sofia Samatar’s ‘I Stole The D.C.’s Eyeglass’ takes us into not dissimilar territory. We see from the point of view of the colonised what it is to be under the rule of an Englishman but also how supposedly lost indigenous technology is brought into play, not only to escape colonial rule but also, and perhaps more important, to escape the mindset inculcated by colonial rule. In Silvia Moreno-Garcia’s ‘Them Ships’ the unnamed narrator, a slum dweller, finds herself enslaved by aliens, along with wealthier members of her own country. Chief among them is Leonardo, who ‘acts like we are totally partners … but he would’ve never even looked at me if we’d bumped into each other on the street ‘. For the unnamed narrator, life under alien rule is not necessarily that bad – there is better food, better conditions; for Leonardo it is intolerable and he compares her to La Malinche, the indigenous woman who acted as Cortes’s translator. The story serves to remind us that under colonial or postcolonial rule, there is no one experience common to all. As Ekaterina Sedia notes in the collection’s afterword, the main theme of all these stories is the ‘push-pull of the contradictory demands of assimilation versus appropriation ‘. We see it manifested in so many different ways through the stories, from the suppression and reclamation of a language in NA Ratanayake’s ‘Remembering Turinam’ to Sunny Moraine’s ‘A Heap of Broken Images’ which addresses such issues as guilt tourism and its effect on the culture that has to deal with it. More than one story touches on the presence of anthropologists and their relationships to the cultures they study, including Dinesh Rao’s ‘A Bridge of Words’ which suggests that in the proper circumstances this can be productive rather than appropriative (underlining, of course, that this is rarely so). And, intriguingly, JY Yang’s ‘Old Domes’ considers the fate of old buildings, swallowed up by so-called regeneration. Jing-Li is a cullmaster of buildings, trained to extinguish the spirits of buildings, spirits made out of the history accumulated in their very fabric. Afterwards, the buildings are reused. In this case, though, the spirit of Singapore’s old Supreme Court is reluctant to go. Again, one might read this as an allegorical story, interrogating the assumption that modernisation is good, and that eliminating the old is a necessity in order to achieve that modernisation, but the story is rather more subtle than that, looking at different responses to history and how it affects a relatively new state. If Mothership is a joyful celebration of diversity in science fiction and fantasy, WSADF is a more focused, more directly political consideration of the effects of colonisation on writers and how that is expressed in their fiction. A number of authors have work included in both anthologies but again in WSADF there are several writers whose names are new to me. In reading Mothership and WSADF together, I feel rather as I did when I encountered Alberto Manguel’s 1983 anthology, Black Water, which first opened my eyes to the variety available in fantastic literature if one did but look hard enough. Reading both these books should prompt SF readers to take a long hard look at the world around them and then ask themselves why they are not reading more by such amazing authors. Because the point is that more diverse genre fiction is out there. It may not be on the shelves in one’s local bookshop but we live in an age when it is easily available online and there is no excuse for not reading it. This entry was posted in reviews, Uncategorized and tagged alberto manguel, aliette de bodard, bill campbell, charles a tan, charles r saunders, djibril al-ayad, edward austin hall, ekaterina sedia, fabio fernandes, j y yang, joseph bruchac, lauren beukes, lavie tidhar, n a ratanayake, n k jemisin, rabih alameddine, rochita loenen-ruiz, s p somtow, shweta narayan, silvia moreno-garcia, sofia samatar, sunny moraine, tobias buckell, victor lavalle on March 19, 2015 by maureenkspeller. Most dystopian or post-apocalyptic novels are very focused on how it happened or on how we are going to change things for the better, and ideally, both. While I can understand why an author would do that – placing protagonists at the centre of the action so that the reader can learn about the situation and how it came into being, and then provide some restorative closure – it always feels rather false to me, not least because this is not how the world works, at least, not on such a grand scale. Maybe I’m just growing old but I am becoming more and more resistant to that ‘man the barricades and we can fix this’ style of fiction, when it is at such variance to what I see in the world around me. Which is not to say that the concept is bad per se, but it is remarkably easy to do badly, and therein lies the offence. If you are going to build a world you need to do it so well it either fades into the background while you get on with the real story, or else if you make it the focus of the story, you make it sufficiently convincing I don’t feel obliged to make lists of why things can’t possibly work. I can think of too many novels I’ve read lately (Edan Lepucki’s California and Naomi Foyle’s Astra being but two) where this does not happen. However, it turns out that there is at least one more way to handle this, and this is the route that Emmi Itäranta has chosen with Memory of Water. Noria Kaitio lives in what she calls the ‘present-world’, somewhere in Scandinavia. Climate change has led, as anticipated, to rising sea levels and the inundation of coastal areas. In the wake of this came ‘water wars’, during which sources of fresh water were placed under the control of the military, where they have remained since. Water is rationed, but for some there is never quite enough and some have resorted to constructing illegal pipelines to siphon off water from the controlled sources. ‘Water crime’, with its obviously Orwellian overtones, is punishable by execution, after a period of dehydration and starvation. And something else has happened along the way – some technical knowledge has been lost, and although they still exist, the electronic goods we take for granted are few, and difficult to get hold of. As indeed is everything else. There is a sense that the military pretty much run everything but it’s not really clear what is going on. Why is it not clear? Because this story is being told from the periphery rather than from the centre; and this is one of the things that makes it so successful. We never see the world as a whole. We see it through Noria’s eyes. She’s seventeen, it’s all she’s ever known, and even though her parents are educated people, who own many books, she takes most things at face value, as do most people. Her life is in the ‘present-world’ and her only real engagement with the ‘past-world’ comes through her friend Sanja’s hobby of combing the rubbish dumps for bits of old technology, which she tries to bring back to life. And indeed, the dumps provide a useful metaphor for the lives the two girls live, a mess of bits and pieces that don’t quite belong together and don’t quite make sense, but it’s all they’ve got. One of the strongest parts of the novel is the portrayal of the friendship between the two girls, very different in character and circumstances, but tied closely to one another in a myriad ways. Itäranta hints delicately that Noria is in love with Sanja, but we have no clue as to the nature of Sanja’s love for Noria, and that feels right. We might wonder what the future holds for them in a world that seems to be deeply conservative but, within the frame of the novel itself, that is a question that cannot be answered, and indeed almost needs not to be answered. It is just part of who and what they are. Noria’s detachment from the outside world is emphasised by her father’s craft: he is a tea master, and she is in turn apprenticed to him. This is further evidence, though unremarked on, of past upheavals. It’s clear from background references that China has been, may still be, in the ascendant, and the ceremonies of tea drinking have spread across what was once Europe. One might reasonably wonder how it is that a ritual that depends so much on water persists at a time when water is a precious commodity – and the answer is precisely that, because it is a precious commodity. Wealth and privilege permit one to use water in ways that poor people can’t. The only real surprise is that Noria’s father hasn’t moved to the city, where he might expect to make a less precarious living. Or perhaps not, given that Noria’s father will not compromise where his craft is concerned. It is this refusal, this exercise of another kind of privilege, that will eventually lead Noria into trouble, once her father shows her the spring hidden deep in the fells, the water from which he uses for his tea ceremonies, a secret handed from master to master. It’s only much later, after her father’s death, once water has been rationed further, and when she sees the villagers suffering, that Noria finally begins to question the actions of her father and his predecessors, that the enormity of her promise to her father, to keep the spring a secret, comes home to her. Not least because it’s clear too that the water police realise that they are hiding a water source, even if they can’t yet find it. While Noria struggles with the moral implications of this concealment, she and Sanja have also stumbled on a mystery, contained on a series of old tapes they found in the dump, and which they’ve managed to listen to. These suggest that a scientific expedition of some sort went into the Lost Lands illegally and made an important discovery. Later, finding more evidence of the expedition’s presence at the hidden spring, Noria realises that they had contact with the tea master of the time. She finally discovers the truth in one of her predecessor’s journals, which draws the reader into a whole new consideration of the business of making records. Her father’s journals had been confiscated when the tea house was searched, but were returned, obviously unread. The threat to knowledge is, if you like, more powerful than actually doing anything with that knowledge. This tension between knowing and not knowing permeates the entire novel. Is it better to know, or not to? And if you do, what should you do with that knowledge? How do you make the right choices when you have no one to guide you? Or worse, when your guide is himself compromised? And the question that is never quite articulated is, just how much has Noria’s father compromised himself in order to preserve his art? And is his art, as a result, itself now compromised. When Noria completes her apprenticeship and is tested by another master, he reluctantly accepts her as such, criticising her for changing certain elements of the ritual as she goes, for not making the choices he thinks are appropriate. Noria defends her choices as sensible accommodations of the situation in which she finds herself but there is an underlying implication that the ritual is in danger of becoming atrophied because its practitioners in the city are seduced by money. And yet, is Noria’s father any better for remaining in the country, seduced by the existence of that hidden spring, whose water will make his tea better? And even here, the story does not falter or collapse, because while Noria is dying, Sanja was able to escape before the military arrived; later she will find her way to Noria’s mother, Lian, who moved to the city once she realised what was likely to happen. Sanja will bring their discovery to Lian, but of course we don’t know what she will do. And I really hope we don’t find out. Because this book is so wonderfully self-contained it would be a pity to break the spell that Itäranta has created and extend the story into an actual concrete sequel. Instead, it stays tantalisingly in the mind as we consider the possibilities. 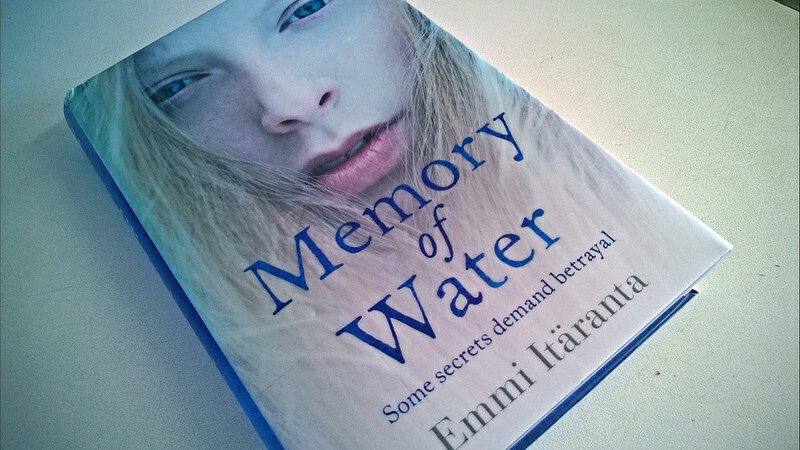 So, instead, let me recommend Memory of Water to you as a necessary corrective to all those dystopian novels with their restorative endings. Exquisitely written, exquisitely observed, it lingers in my memory long after the others have all blurred into one. This entry was posted in reviews, Uncategorized and tagged edan lepucki, emmi itaranta, naomi foyle on March 18, 2015 by maureenkspeller.